Geek Life Culture Baumgartner Beaten By a Teddy Bear and Raspberry Pi! Baumgartner Beaten By a Teddy Bear and Raspberry Pi! We were all kids once. And inevitably we all played with toys. Okay, bad example – I just realised I’m writing on a geek website and therefore we as geeks didn’t quite stop playing with our toys. Except now we call them ‘collectable figurines’ or ‘diecast models’. I know I do. Anyway, I spent many a happy day as a young kid playing with toys, pushing cars around the carpet (or in my mind, a huge superspeedway racetrack) or crawling through the flowerbeds with my Action Men in the back garden (or in my mind, Arnhem 1944). I remember many times strapping plastic bags to my Action Men to act as parachutes and flinging them off high things – normally the top bedroom window – and watching as they messily tumbled to the ground. In my mind it was a glorious D-Day style landing. In reality it was another battering for my poor moulded plastic Hasbro troops. Either way, toys were great fun, and one should never entirely loose the wild imagination that toys inspired within us as kids. But what if you combine that imagination and vision for the grandiose with hugely nerdy levels of knowledge on computing, programming and science? And then use all that to take on a huge energy drinks corporation and a man who fell from space into the record books? 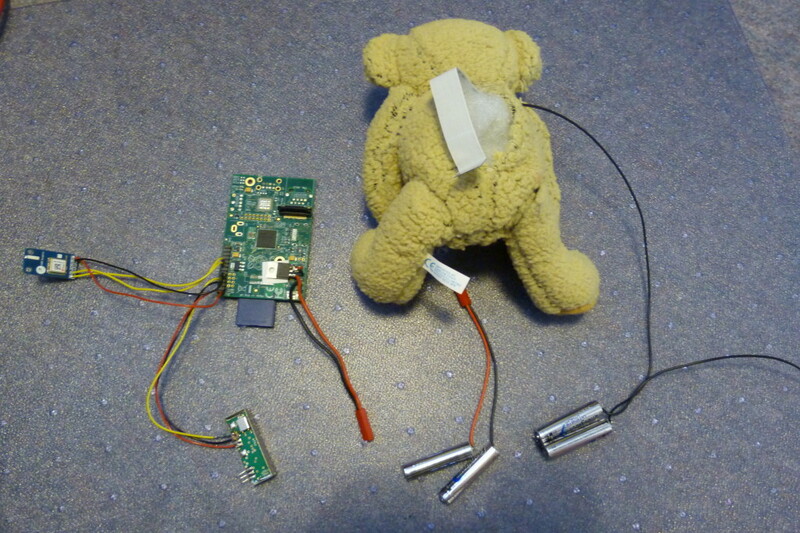 Using a teddy bear, a $30 computer, and a Smarties tube? I know, it all sounds like the rejected plot for a Big Bang Theory episode, but stick with me. Because someone has done exactly that. Move over Felix Baumgartner – your altitude record has been broken. By a teddy bear. And a Pi. Let’s bring together the elements. First we have Dave Akerman, a self employed PC and embedded systems programmer, and on the side a high-altitude balloonist, living in Berkshire, UK. We have the Raspberry Pi computer, a credit-card sized motherboard which compresses everything you would want in a computer – good graphics, internet connection, RAM, the lot – into a tiny, cheap package. It is designed as an easy entry into the mystical world of programming (one I tried myself to learn about at A-Level – the U on my exam paper will tell you I utterly failed. If only the Pi was around in 2009) by being easy to use, affordable and accessible. But I’m not sure even it’s creators were sure of it’s full capabilities. Certainly I’m not sure they knew that it could be stuffed inside a cuddly toy and used to pilot him into space and back to earth again. Which brings us to the final element – Babbage the bear. The official mascot of the Raspberry Pi company and available to you for £9 from their website. A cuddly soft toy, a cute mascot and a fearless space explorer. Everything you could want in a teddy bear really. So what’s a middle-aged man to do when he doesn’t have the bravery, technology or sponsorship money to emulate Felix Baumgartner? He scales the whole project down and send a soft toy up to do the job for him. And as luck would have it, Babbage is the perfect size for a Raspberry Pi computer to be mounted inside. Who needs a conventional computer case anyway? With additional cameras mounted in the eyes and wires popping out of every orifice, the Six Million Dollar Bear was born. To be honest, I would only fail spectacularly to do justice to the details of the flight and how Mr Akerman set it all up, so I will instead link through to Akerman’s own journal of the launch here, or Raspberry Pi’s log of the launch here. Or rather, launches. Because the first attempt, as you will read in those incredibly informative links, didn’t go exactly to plan. Unless you think a free-falling parachutist not bailing out of their capsule and free-falling then parachuting to Earth is a success. Although the plucky bionic bear still achieved a world record even on this failed run – the highest recorded altitude for amateur image transmissions, which Babbage now holds at 41.1km. A noble achievement, but not the record team Ted Bull Stratos (see what they did there?) were looking for. So back to the drawing board, and two days later on a much less blustery and sunny Monday, Babbage floated up, and up, and up, and into the record books when this time he did detach from capsule at exactly 39km up – a full 31 metres beyond Baumgartner’s mark. Considering Ted Bull’s budget was £300, compared to Red Bull’s £30,000,000 (yup, that’s 30 MILLION), I’d say that’s quite a knock-down bargain. Unfortunately since Babbage is hardly as aerodynamic as a man in a high-tech spacesuit, Baumgartner’s other records relating to speed of descent remain intact. But one out of three ain’t bad, right? And as ways to demonstrate the simplistic powers of the Raspberry Pi platform, it doesn’t get much better than that. Adam is a 21-year-old Media Writing student from the University of Greenwich who is tough on hipsters and tough on the causes of hipsterdom. A gamer of all generations stretching back to the Sega Genesis and a fan of Crash Bandicoot, Metal Gear Solid and games that prioritize fun and freedom over epic special effects, he's also a Youtuber and a fan of fast cars, roller derby and Queen.